Cancer vaccines are the next step in our continued fight against cancer. Along with the standard of care treatments of surgery, chemotherapy and radiation cancer vaccines as a fourth arm may prove very valuable in waging this fight. In the last decade with the human genome project completed it has given scientists new and more definitive targets to begin to unravel the complex puzzle of cancer therapeutics. This innovative therapy will help to begin to breakdown the genetic, molecular cellular and immunologic mechanism that allows tumors to persist. Improvement in our understanding of tumor immunology has facilitated progress in the development of cancer vaccines. Many of the vaccines employ immunotherapy" . Immunotherapy (dendritic cell vaccines) DC are immature immune cells found in the body, they are highly mobile and carry antigens, their role is to identify foreign material in the body, bacteria, virus, tumor cell, which can activate specific white blood cells (killer T cells) and can be targeted to teach the immune system to recognize foreign material like brain cancer cells and attack and kill them. Results have shown considerable extended survival for patients with GBM employing these vaccines. The chief aim of cancer immunotherapy is to enhance the immune response against specific tumor targets. Tumors are amenable for immune recognition, as they present specific tumor antigens that are recognized by immune cells. Most of the current clinical trials for brain tumor vaccines (43 of which 18) are currently recruiting) consist of boosting the patient's immune system to fight off the tumors. Either by using the patients own tumor cells or more generic glioma associated antigens that many brain tumors express, which can be used for unresectable tumors where no tumor sample is available. As we begin the 21st century there are still no therapeutic cancer vaccines licensed for use in the US. 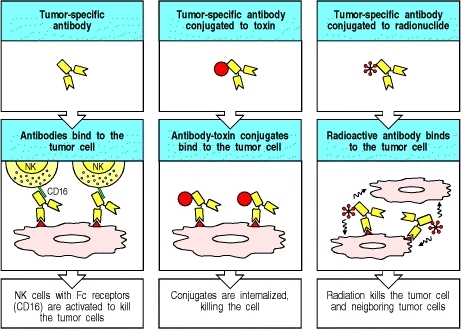 In the past decade, advances in immunology and molecular biology have led to the identification of specific tumor antigens (proteins).Therefore current and future treatments can begin to be highly specific and effective based on the ability to develop personalized tumor specific antigen directed vaccines. Since the completion of the human genome project, new technologies are quickly identifying antigens that produce the best immune responses. These are being incorporated into each new vaccine trial that becomes available. Phase I trials of vaccines are normally given to incurable or untreatable malignancies. Since immune responses are often impaired in patients with advanced disease and advanced cancer does not normally evoke an intense innate immune response, immunotherapy is most beneficial used in either early stage cancer or in stages of minimal residual disease. Therefore, efficacy questions may be better answered and may require studying patients with less advanced disease. Presently, patients with low grade tumors have few options for therapeutic vaccines. Hopefully this research will open up the field of vaccines to these patients. It is believed that the earlier the treatment is given the more effective it will be. There is reason to believe that therapeutic vaccines would require continued boosting or even retargeting of antigens as part of a maintenance regimen for patients with responses or stable disease. It is very important to understand all the medical and clinical trial options available when you are diagnosed and before you seek treatment in order to remain eligible for all the possible vaccine trials offered. 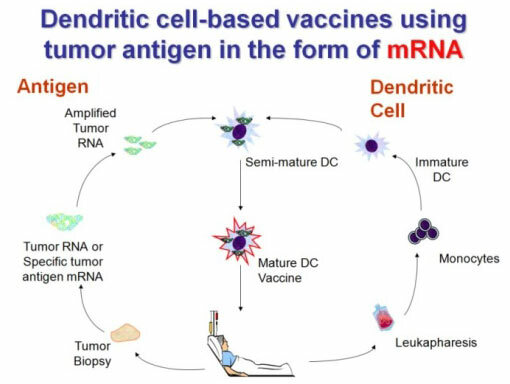 Immune adjuvants such as POLY ICLC, Sagramostim, Imiquimod, and Montanide are used in conjunction with immunotherapy vaccines to help further stimulate and enhance the activated dendritic cells to fight the tumor. IF you see one that is missing, closed or incorrect - please let us know!